Receive the canvas by email. Why are prospects not converting? Turn negatives into positives with an actionable marketing brainstorm. How should I use the canvas? Discover and optimize the vital growth levers of your business. 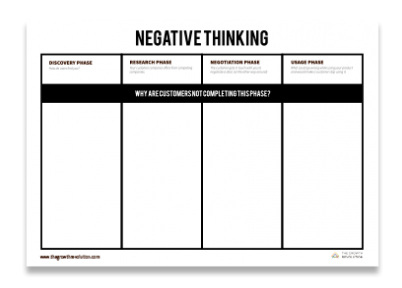 The Negative Thinking Canvas is divided into 4 phases of your customer funnel. Why are prospects not acting the way you expect? After collecting your negatives per phase, discuss in group what you wrote down. Drop your ideas on the canvas. Take 10 minutes per phase, maximum. Urgency drives creativity. Everyone is free to write down all their ideas. Grab your post-its! For the last step, every participant has max. 3 votes to choose the most important working points. These are the fundamental change factors to focus new tactics on. "Our needs were well-mapped out giving us an efficient way to generate a solid concept." Discover and optimize the vital levers of your business with a structured approach for your team. Tired of copying last years marketing plan? You need to be ahead of your competitors. Take only one hour to brainstorm with the negative thinking canvas to turn negatives in to positives.